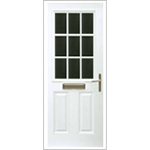 Peterborough Doors offer an excellent selection of high quality GRP doors. Our Harvard style GRP doors come with a multi point locking system, toughened Pilkington energy saving safety glass, reinforced frames and panels, left or right hand hinged, open in or out and not forgetting a full 10 year guarantee. 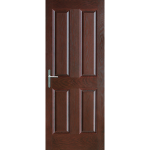 Excellent value GRP doors. Our GRP doors are available in white, light oak or rosewood and come with an excellent choice of furniture to compliment your already great looking GRP door. Peterborough Doors is a family business and we guarantee to supply your family with excellent quality GRP and uPVC composite doors. A two panel uPVC door with grill effect windows. Most competitive prices, very Cheap/affordable GRP prices within Peterborough doors. A two panel and one sunburst GRP door which has chrome hardware and a stippolyte enforced window. 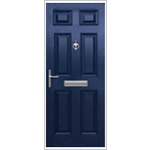 This model is perfect for use as a front door and can be ordered in seven colours and through advancements, made in GRP door manufacturing it is highly unlikely it will ever need repainting. A no-nonsense four panel GRP door, built using the latest advancements so you can be sure that this door will not warp or drop. Making it perfect for use as a garage door or any outfacing GRP door when you don’t need windows. This model comes with chrome fittings and hardware as standard, making it easy for you. 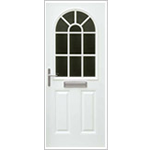 Peterborough Doors is a family business and we guarantee to supply your family with excellent quality GRPdoors within the Peterborough area. GRP composite doors.